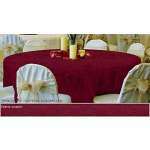 Buy Banquet Furniture, Banquet Chairs: See Our Best Sellers! Getting the right banquet furniture for your social hall will make a big difference when it comes to special events. Before you start planning and shopping, it is important to answer a basic question. What kinds of furniture do you need for special events? Besides the necessary banquet chairs and tables, there are lots of extra details that can really make a difference. When it comes to making your space stand out and sparkle, table linens create a real transformation. Tablecloths, table skirting and cloth napkins come in a selection of colors and fabrics that will give your space a brand new look. Having a few sets of table linens that can be mixed and matched for various celebrations will make each event a unique experience. What should you look for in banquet chairs? 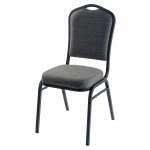 Unlike standard stacking chairs, banquet chairs are a bit more elegant and always include some comfy padding. The quality and thickness of padding vary, so it’s important to make sure that you invest in an option that will keep your guests comfortable. Of course, a sturdy frame is a must-have as well. Stacking is a great feature because it saves space in storage and makes it easier to transport chairs during setup and cleanup. With a selection of upholstery fabrics, colors and patterns, you can coordinate with any space. How do you choose banquet tables? Getting the right fit for your space is important when it comes to special events. Of course you want to maximize seating capacity, but you also want to make sure that guests don’t feel like the room is too crowded. The right banquet tables will strike the perfect balance between sturdiness, attractiveness and seating capacity. Folding tables are the best option for any space because they are easy to transport and store. They can also be set up quickly in an unlimited variety of configurations. 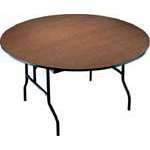 There are lots of options when it comes to banquet tables. The main choices for materials are blow-molded plastic and laminate. Laminate is the most budget-friendly option, but is not the best choice for heavy use. Blow-molded plastic tables are incredibly sturdy and durable. If your folding tables are going to be used on a consistent basis, they are by far the best choice. After choosing the right material, you will need to consider shape and size. All shapes have their advantages and the right sizes will depend on your space and needs. Our experts on the Project Solutions team can help you figure out just how many tables you should get and what shape and size are ideal for your space. Table skirting attaches to the perimeter of a table to hide the space underneath and create a more elegant look. With table skirts around your banquet tables, your whole space will look more elegant. You can choose a fabric that blends seamlessly with table cloths or choose a contrasting color. Our selection of colors and fabrics lets you choose a color scheme that fits your space and taste. 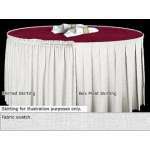 You also need to choose whether you prefer a box pleat or shirred skirting. Both choices are stately and attractive, so either option will make a great choice. When it comes to setting up for a banquet, tablecloths and cloth napkins are essential. Ordering a few sets in a variety of fabrics and colors will give event organizers the opportunity to choose the color or combination of colors that best fits the occasion. Of course you want to make sure that all options are sized just right for your banquet tables and coordinate with the decor in your banquet hall. Setting up for special events is a pleasure when you have great banquet furniture from Hertz Furniture. With our complete collection of banquet essentials in a great selection of sizes and styles, you can get a custom fit and a great look in any space. Whether you just want a new set of chairs or new tablecloth hue, or you want to furnish a full social hall, we have just what you need to make your space sparkle.